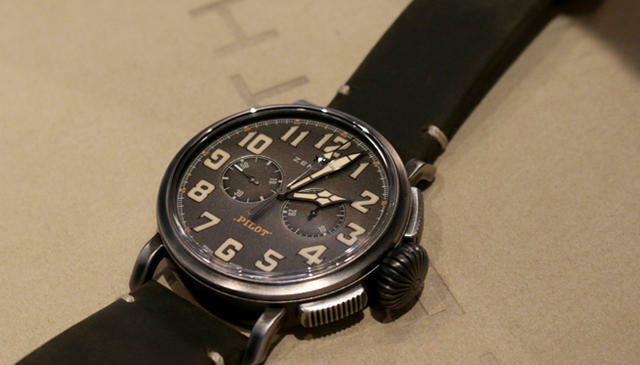 This model, which technically belongs to the Pilot family, may be the most intriguing addition to that lineup since 2012’s gargantuan caliber 5011K-powered Pilot Montre d’Aeronef Type 20. By altering the marketing focus to celebrate the early 1950s “café racer” motorcycle culture, Zenith adds a genuinely new thread to often rote pilot’s watch genre. The charming simulated patina slate-green dial, an exclusive “oily nubuck” calf-skin strap, El Primero caliber 4069, and a very wearable 45mm steel case complete this imaginative package. Sometimes an existing watch is a only few details removed from greatness. 2009’s Senator Chronometer Regulator was a striking piece, but the finely textured silver dial was too cool by half; 2016’s blue dialed reboot of the Regulator hits home with intensity and soul lacking in the original. 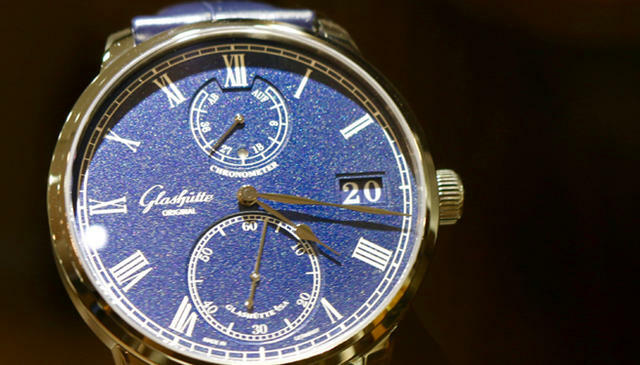 Graced by a combination of applied silver, blue lacquer, and white gold hands, this new dial is a star. And having been manufactured entirely within GO’s Pforzheim dial factory, all artisanal credit is due entirely to the manufacture. Technically, this is a component of another 2016 novelty, Chopard’s Mille Miglia XL Race Edition. 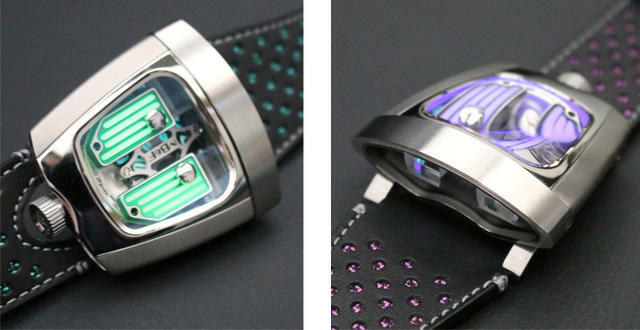 But the intriguing subtext herein is the remarkable water resistant virtues that Chopard is advertising for this strap. The accessory is designed to endure sweat, rain, and splashes. 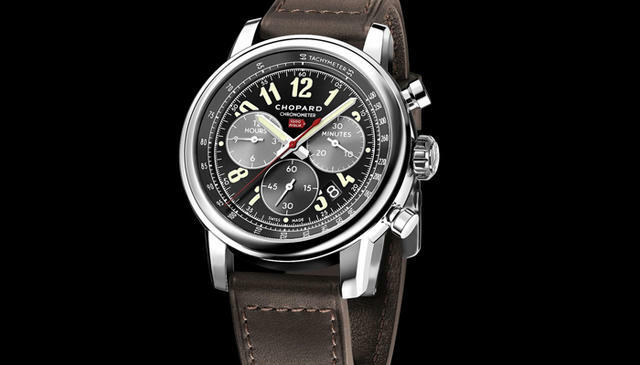 For good measure, Chopard advises that no two examples of the “Suportlo” strap will age identically over its years-long life expectancy, so the effect will be unique to each of the 1,000 Mille Miglia XL Race Edition units. And it begs the question, why don’t more brands offer water resistant leather straps on sports models? This one soars on the strength of childhood dreams. 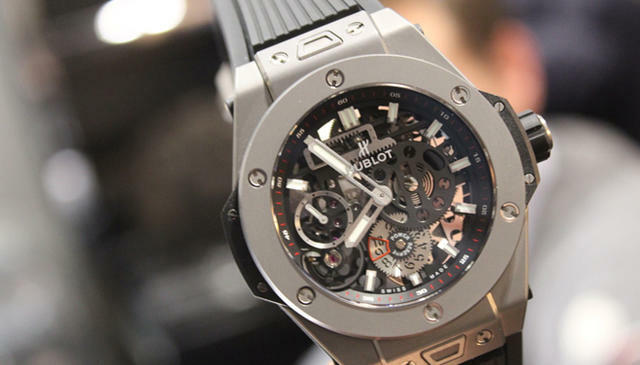 Hublot designed the in-house caliber 1201 specifically to evoke the look and character of Meccano and Erector Set components beloved of tech-inclined kids. The girder-like bridges of the ten-day manual wind movement are designed to exude mechanical-cool, but the effect is more like a Swiss tribute to diesel-punk imagery. With a clever dual-display power reserve, openworked dial, and titanium (unlimited) and ceramic (500 pieces) case options, the Big Bang Meca-10 ranks among the best balances of engineering and art design to be seen at this year’s Baselworld fair. This novelty feels like the natural heir to 2012’s “First Omega In Space,” the so-called “Numbered Edition.” Both models feature similar case profiles, lugs, and hand design (including “lollipop” seconds hand in the CK2998) that pay homage to the 1959 Speedmaster Ref. CK2998. But whereas the “FOIS” was a studiously faithful tribute in form and fashion; by comparison, the CK2998 isn’t afraid to take liberties. The lighthearted blue and white color scheme lends this watch a cheerful countenance, and the designers’ willingness to deviate from the source material ensures that the CK2998 LE will stand on its own as a worthy entry in the Speedmaster annals. 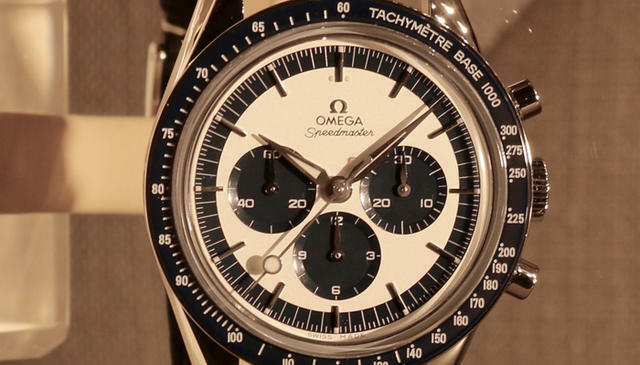 A fully luminescent tachymeter scale completes this whimsical take on Omega heritage. Lucerne-based Carl. F. Bucherer spent a huge amount of energy at Basel 2016 emphasizing its link to the founding family’s city of choice. 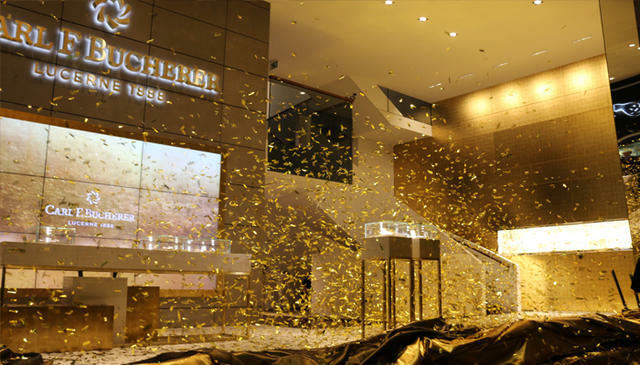 But the real news to emerge from Bucherer’s 2016 “Five Milestones” campaign is the consideration being given to after-sales service personnel and infrastructure. Strictly speaking, “luxury” mechanical watches as a class of goods have come into their own since the early 1980s end of the “Quartz Crisis” years; most of the “luxury” watches ever built have been constructed in the last 30 years. For many manufacturers, the rush to ride this sales surge has outstripped the capacity to service what has been built. Bucherer has integrated a major service center into its CHF 10 million manufacture complex in order to prepare for the influx that many others simply are at a loss to handle. Meeting newly minted MB&F “friend” James Thompson should be an included component of the ownership experience for the 54 fortunate collectors who will take delivery of the newest Horological Machine. Black Badger Advanced Composites founder Thompson is live-wire entertaining, and he’s precisely the kind of electrifying creative force mainstream manufacturers want buyers to imagine work behind the scenes of their design efforts. It helps that the final product, the HMX Black Badger, lives up to Thompson’s swagger. The glow of all three variants simultaneously evokes the sticky nuclear fuel rod from “The Simpsons” intro sequence and the bioluminescent overload from “Avatar.” By the time you realize it’s also a watch, the fact seems almost trivial. This may be the subtlest – and most sublime – member of the Yacht-Master family. 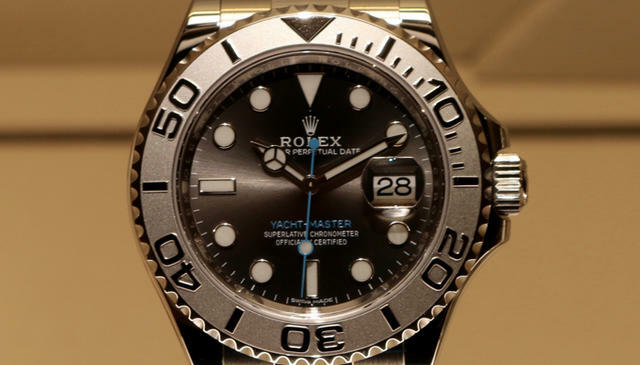 As the Submariner’s posh cousin, the Yacht-Master exudes a Patrician hauteur that sets it apart from the mainstream of the Rolex “tool” watches. But the quietly cool demeanor of the new “Dark Rhodium” sunburst dial takes a page from the best utilitarian Rolex classics. The greyscale combination of rhodium, stainless steel, and platinum places the 116621 firmly in the hunt for the sports watch traditionalist’s attention. Its cool visage packs none of the exhibitionist tendencies of the all-gold Yacht-Masters, the two-tones, the sunburst blue dial of the 116622, or the Oysterflex-clad 116655. 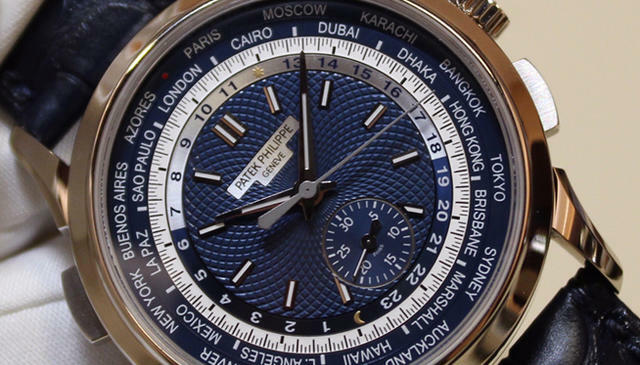 True, it’s almost a default move to pick a spectacular Patek Philippe complicated chronograph as a highlight. But beyond the unique combination of world time and automatic chronograph caliber, Patek Philippe’s latest features an impressive tandem of stunning dial and imposing case. Inspired by a one-off historical reference, the 5930G translates that vintage model’s stepped lugs into delicate soldered and beveled white gold. The 39.5mm profile of the case is strong yet sensuous. A flat and narrow bezel maximizes the visual impact of the complex rose lathe-turned dial and its generous spread of blue-galvanized guilloche. The interplay of silver, white, gold, blue, and many textures imbues this dial with real dynamism. Had this watch been merely a mishmash of crowd-pleasing complications, it would have sold. By going the extra mile on case and dial, Patek Philippe ensured that the 5930G has soul. 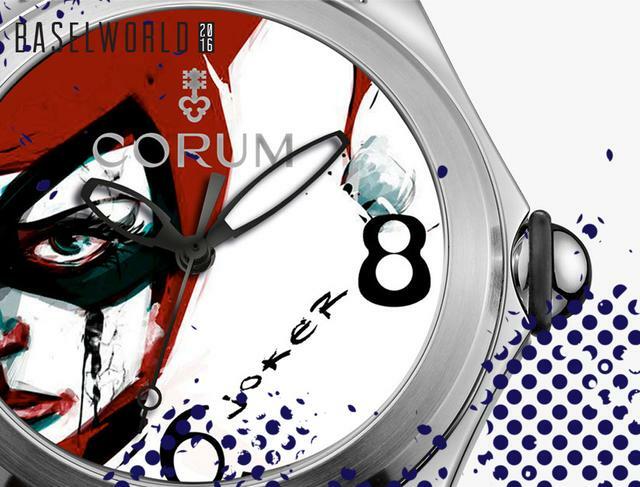 Ok, officially, this watch is the “Corum Heritage Bubble Joker,” and it’s one of 35 new variants of the Corum Bubble to launch at Baselworld 2016. 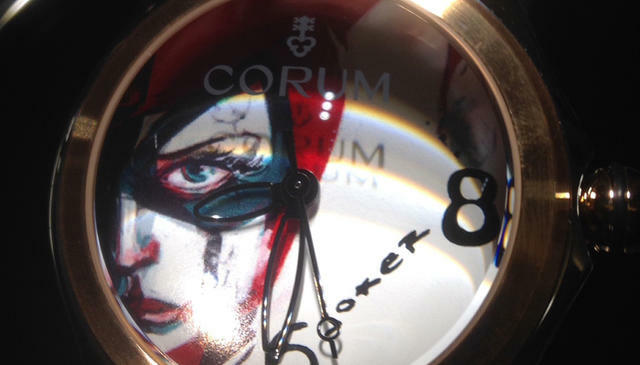 But let’s get real; that’s Harley Quinn in all but name. And if you’re a nerd worth your wasted youth, you know exactly what I’m taking about. If not, revert to item #2, and give the top slot to the Patek.